Kits are available for this project from Talking Electronics for $15.00 plus postage. you want to re-program the micro. 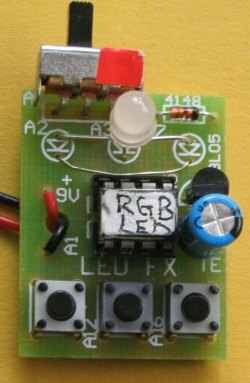 This project produces a number of effects on an RGB LED. You can also produce your own sequence (by using the 3 buttons) and store it as sequence 1. You can build the project on Matrix Board or buy a complete kit with pre-programmed chip. You can also program the chip yourself and use this project as the beginning to: "learning to write your own programs." and just after the 271 SM resistor (see note below). Note the link using enamelled wire. micro has 47k internal pull-up resistors enabled. The circuit is very simple. It is just an RGB LED and 3 switches. All the work is done by the micro. We have added a 5v regulator and diode so the project can be connected to all sorts of voltages and the regulator will not be damaged if the supply is connected the wrong way around, as the diode will simply not conduct. . 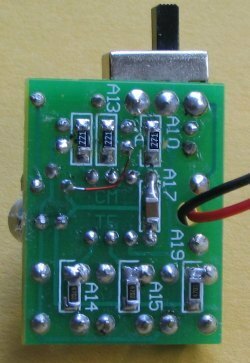 It will work on 6v if the regulator is removed or on 7v to 15v (AC or DC) with the regulator fitted. This makes it suitable for a 9v battery or the AC supply from a model railroad. I know you are going to say "it is inefficient using a 9v battery" but it is convenient. In fact you can use a set of very old cells, providing they produce at least 8v and this is a good project for using old cells. The project creates a number of effects on an RGB LED, including PWM (Pulse Width Modulation) to show the effect of turning on the LED(s) for a very short period of time then turn the LED(s) off for a longer period of time. This will reduce the brightness and also consume less current. When this is done to all three LEDs a range of colours can be created. This involves delivering a different percentage of ON-TIME for each LED to produce a specific colour. The major purpose for the introduction of the RGB LED was to produce a wide range of colours, plus white. This allows it to be used for screens such as TV screens, to reproduce moving images. Any sort of display requires a lot of LEDs and this requires many drive-lines. A single 8-pin micro an only drive one or two LEDs and we have opted to use a single LED and show the range of effects that can be produced. The RGB LED supplied in the kit is high-bright. It is too bright to look at directly but can be used for all sorts of applications and effects. You can reduce the brightness by increasing the value of the current-limiting resistors to suit your own application. The PWM sequences reduce the brightness and you can observe how effective they are at reducing the current consumption. 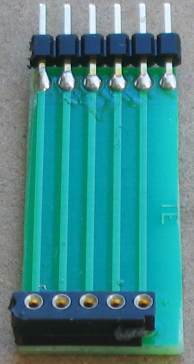 We have used 220R and 270R resistors to reduce the brightness so the output is not too bright. We have used SM components for convenience, ease-of-use and to make the PC board as small as possible. Once you start using them you will never go back to through-hole components. They also make the project look simpler as they "disappear" under the board; or if you are developing a single-sided project, they reduce the size of the final design. You will need fine tweezers to hold them in place while one end is soldered. Always use very fine solder as you only need very little for each component and the main reason for adding extra solder is to take advantage of the flux to clean the connection. Always solder resistors with the value showing. So, we have two areas of interest. Construction and programming and it's up to you to take it on. The project is designed for all sorts of uses, including models such as train layouts, alarms and similar effects. But the real thing we want to get across, is programming. This is another example of using a simple 8 pin chip to provide a number of features that would take many logic chips (such as counters and gates) and lots of components to duplicate. It also highlights our method of hand-coding as an effective way to produce a program. 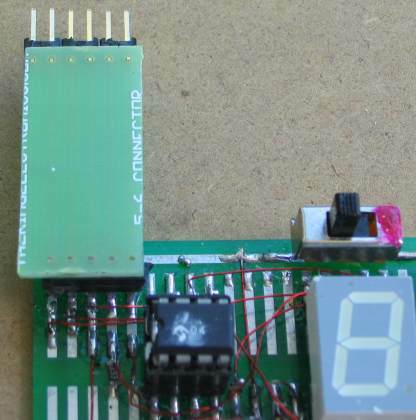 This project uses about 400 instructions to produce the effects and it uses the EEPROM to store the sequence produced by the user (sequence 1) - and show it at turn-on. In this respect, some of the sub-routines in the program are quite complex and suitable for the advanced programmer. However, if you are a beginner, you can read through the program and most of the sub-routines will be easy to follow as each line of code is explained. You have to start somewhere and this project offers a challenge. Most projects with a program of this complexity are only available as a pre-programmed chip or only the hex code is available. There is usually no attempt at educating the reader in programming. That's the difference between our projects and all others. We offer a learning curve. For every hour of effort you put into reading, building and using one of our microcontroller projects, you get the experience of 100 hours of effort that has been put into the design to make it appear simple. All you have to do is start . . . The first sequence can be created by the user. It currently produces a very slow flash-rate as it has not be programmed. The other 24 sequences are pre-programmed. Turn project ON then push the first button (called SwA) and hold it down and the sequence will change to the next sequence. Release the button and allow the sequence to cycle. Push SwA again and the sequence will change. You need to allow each sequence to cycle with the button not-pressed and then push SwA and keep it pressed until a new sequence shows. This is due to the debouncing in the program. See below for the list of 25 sequences. TO CREATE YOU OWN SEQUENCE. 1. Press SwA and at the same time, turn project ON. 2. Release SwA and press the switches in any order (up to 15 steps). A step or delay cannot be longer than 2 seconds as the program will "time out." When finished, wait 3 seconds and the sequence will show on the LEDs. 3. Turn project off and on. The new sequence will appear as the first sequence. 1. Turn the project ON and increment the sequences. 2. To save the desired sequence, press SwB. The display will die. 3. Turn project OFF then ON. The desired sequence will show at start-up. 4. To delete this feature, push SwC and at the same time, turn project ON. Sequence 1: This sequence is created by you. See above for details on creating your own sequence. The kit comes with a pre-programmed PIC chip but if you want to program your own chip or modify the program, the .hex file is available as well as the assembly file, so you can see how the program has been written and view the comments for each line of code. The PIC12F629 is one of the smallest micros in the range but you will be surprised how much can be achieved with such a tiny micro. The program contains sub-routines to produce delays, sequences on the display and both read and write EEPROM jobs that require accurate code - including a special sequence - called a handshaking sequence that prevents the EEPROM being written due to glitches. Even a program as simple as this is not easy to put together and to assist in this area, we have provided a whole raft of support material. Not only do we provide a number of programs with full documentation but our approach to programming is simple. It involves a method of "copy and paste" whereby sub-routines are taken from previously written code and copied into your program. Any modifications are made in very small steps so that each can be tested before adding more code. This is exactly how we produce a complex project. Each step is written and tested before adding the next step. This saves a lot of frustration as it is very easy to add a line of code that is incorrect and get an unsuspected result. If you follow our suggestions you will buy a programmer ("burner") called a PICkit-2 if you are using a laptop. It is the cheapest and best on the market and comes with a USB cable and 2 CD's containing the programs needed to "burn" the chip. If you are using a desk-top and/or tower with a serial port, you can use a cheaper programmer called MultiChip Programmer from Talking Electronics. You will also need NotePad2 to write your .asm program. This can be downloaded from Talking Electronics website. 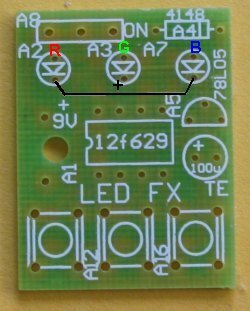 You will use RGB LED_FX.asm or RGB LED_FX-asm.txt as a template for your program, plus a 6 pin to 5 pin connector that fits between the burner and the project. This is also available on Talking Electronics website. As we said before, this project is for medium-to-advanced programmers as it is very compact and does not have in-circuit programming pins. To be able to modify the chip you will need a programming socket and this can be obtained from one of our other projects that contains the 5 pins for in-circuit programming. You can then put the chip into the other project to be programmed and modified and re-fit it into this project for execution. There are a number of kits, programs and courses on the market that claim and suggest they teach PIC Programming. Most of these modules and courses use a PIC microcontroller as the chip carrying out the processes, but the actual programming is done by a proprietary language invented by the designer of the course. Although these courses are wonderful to get you into "Programming Microcontrollers" they do not use any of the terms or codes that apply to the PIC microcontroller family. All our projects use the 33 instructions that come with the PIC Microcontroller and these are very easy to learn. We use the full capability of the micro and our pre-programmed chip is less than the cost of doing it any other way. In addition, anything designed via our method can be instantly transferred to a PIC die and mass produced. And we use all the input pins and all the memory of the chip. The other approaches use less than 25% of the capability of the memory and one of the pins is not available. In fact it would be difficult to reproduce this project via any of the opposition methods. It would require a larger chip and more expense. You can use our method or the opposition. Just be aware that the two are not interchangeable. Ours is classified as the lowest "form" (level) of programming - commonly called machine code - invented in the early days of microprocessors - and now called mnemonic programming as each line of code is made up of letters of a set of words. The opposition uses a higher level language where one instruction can carry out an operation similar to a sub-routine. But you have to learn the "higher level language" in order to create a program. And this requires a fair amount of skill and capability. It sounds great and it is a good idea. But if you want to learn PIC programming, it does not assist you. It is "a step removed" from learning PIC language. The other disadvantage of the opposition is the "overhead." The 1,000 spaces allocated for your program is filled with pre-written sub-routines. You may require only 10 of these sub-routines but ALL of them are loaded in the memory space. And they take up all the memory. You have no room for your own program. To get around this the opposition uses the 128 bytes in EEPROM to deliver instructions on how to apply the sub-routines. This provides about 30 powerful instructions using their language called BASIC (or a similar language). It's a bit like selling a diary filled with all the paragraphs you need to express yourself, and leaving a few blank pages at the back for you to write single lines such as: see page 24, paragraph 7, see page 63 paragraph 4, to create your diary entries. It depends on how much you want to be in charge of writing a program. Using our method is like writing your own auto-biography. Using the opposition is like getting a "ghost writer." When using a higher level language to create a program, you have absolutely no idea how the code is generated for the micro. In some of the developmental kits, the code is "locked away" and you are NEVER able to access it. Everything runs smoothly until a fault appears. With our method you can see the code. With the other methods, you cannot see the code - it's like doing key-hole surgery without the advantage of an illuminated endoscope to see what you are doing. Everything has its place and our method of hand-assembly is only suitable for very small micros and you will eventually need to "learn a high level language." The PIC12F629 has over 1,000 locations for code and this equates to more than 20 pages when printed, so this is about the limit to doing things by hand. But our drive is to show how much can be done with the simplest devices on the market, at the lowest cost. Anyone can show you high-technology at a high price but this is not where you start and this is not where you get enthusiasm. We provide the things to get you started. That's the difference. The RGB LED FX project is built on the same PC board as LED FX. The kit of components comes with all the parts you need to get the project working, including a pre-programmed chip and PC board. To modify the program you will need a PICkit-2 programmer and this comes with 2 CD's containing all the software needed for In-Circuit Programming. You will also need a lead (comes with PICkit-2) to connect the programmer to your lap top via the USB port and an adapter we call 6pin to 5 pin Adapter to connect the PICkit-2 to your project. The program does a bit of detecting when turned on. It detects to see if a bit has been set in EEPROM to tell the micro to go to a required sequence or start with sequence 1. It also detects if switch A or C has been pressed at the instant the project is turned on so that the micro is directed to the sub-routine where the user-sequence can be entered or if the EEPROM bit is to be cancelled. All this gets done in the SetUp routine and then the micro goes to Main. In Main, the program increments a "jump" file and calls a table where it finds a directive to go to a particular sub-routine. The sub-routine is executed and the micro goes back to Main where it looks for a release of SwA. This forms part of a key debounce as the key must be fully debounced as it is advancing the micro through the sequences. To provide a totally reliable debounce, the key is detected as not being pushed for the duration of a whole cycle of a sequence and a separate loop is then executed where the key can be detected as being pushed, to advance the program to the next sequence. To create your own sequence as sequence1, the project is turned off and SwA pressed while turning the project ON. This sends the micro to a sub-routine called Attract. As soon as SwA is released, the program starts to time the duration when a switch is not pressed and it "times-out" after 2.5 seconds. The program also times the duration when a LED is illuminated. It also accepts 2 or 3 LEDs illuminated at the same time. These are all clever instructions that need to be looked at to see how they operate. Up to 15 steps can be entered and each step occupies three bytes. The first value identifies the illuminated LEDs, the second byte identifies the ON duration (in increments of 5mS) and the third byte identifies the OFF time. These 45 bytes are contained in files 30h to 5Fh. When a switch is not pressed for 2.5 seconds, the program "times out" and sends the values to the EEPROM. It then shows the sequence on the LEDs. If the project is turned off and on again, this sequence will be displayed as sequence1. To replace the sequence with something else, simply repeat the steps above. If you want one of the pre-programmed sequences to appear each time the project is turned on, simply advance through the sequences by pressing SwA and when the desired sequence is playing, push SwB. This will record your choice. Turn the project OFF then ON again and the chosen sequence will be displayed. To remove this feature, press SwC when the project is off and at the same time, turn the project ON. All these feature have been added to the program, one at a time, and it is important to add them in the correct order. For instance, you can only add a removal feature after the initial feature has been produced. Reading and writing to the EEPROM is a most complex operation and the instructions must be laid out as shown in the program, as they include a hand-shaking sequence. When you need this code it is copied and pasted in its entirety, to prevent a mistake. Nearly every instruction has a comment to explain not only what it does, but why it was chosen. If you think you can start programming without reading programs from other developers, you are wasting your time. No individual can work how to do many of the tasks via the simplest set of instructions and you will find some programmers have used complex code to do the simplest task. That's why you have to pick out the "wheat from the chaff" and remember a good routine, while discarding the over-complex sets of code. Don't expect to be an A1 programmer in a week. It takes time to absorb the skills of programming and it is really only understood by a microscopic percentage of electronics enthusiasts. If you take it up and understand it, you are one of the microscopic few. It is a world that, once you are in, will open up a whole new field of ideas and development. It's like taking up a new spoken language and, in fact, a program reads like a book, so the analogy is very close. There are some very "clever" instructions such as XOR where you can compare two files by using the XOR function and determine if they are the same. And very powerful instructions such as djnz that decrements a file and if it is zero, the micro jumps over the next instruction. Other clever instructions transfer the contents of a file to another via the "carry." You cannot be expected to know these "tricks" unless you study programming. That's why we are here. btfss	gpio,5		;SwA to: "record new sequence"
;5mS delay for increments in timing for "New Sequence"
;SwB puts current sequence into EEPROM for turn on. bcf 	gpio,0      ;turn on red LED  . bcf 	gpio,0      ;turn on red LED   . bcf 	gpio,1      ;turn on green LED   . bcf 	gpio,1      ;turn on green LED  . bcf 	gpio,2      ;turn on blue LED   . bcf 	gpio,2      ;turn on blue LED  . 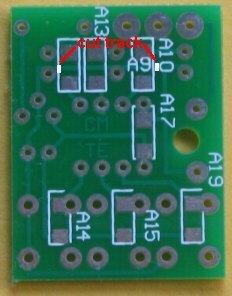 clrf	gpio      ;turn on LEDs   . clrf	gpio      ;turn on LEDs  . btfss	gpio,5		;Is swA still pressed? We have not produced all the possible sequences and you can add more by simply creating a new sub-routine. You need to add it to the table and make sure you end with retlw 00 to send the micro back to Main. We have provided all the hardware and software for you to do this. Now it's now up to you.